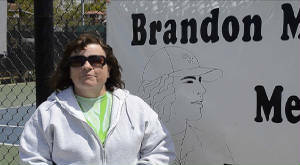 Brandon McPherson Memorial Foundation, Inc. The Brandon McPherson Memorial Foundation, Inc. was created to honor the extraordinary life of our son, brother, and friend. Brandon McPherson.... Full of light, life, energy, intelligence and humor... a young man meant to do great things! Brandon McPherson was born May 31st, 1987 and lived and loved life more during his 16 years than most people do in a lifetime. Family and friends were a central part of his life as he excelled in sports, school, scouting and civic leadership. Though Brandon's extraordinary life was tragically cut short in an automobile accident on April 10, 2004, it is our family's and friend's joy to carry on Brandon's passion for learning, sharing and laughter through the Brandon McPherson Memorial Foundation, Inc. The foundation's mission statement is "Creating Extraordinary Opportunites"
In the past ten years, we have been able to award six college scholarships to Eagle Scouts, nine college scholarships to Park Hill tennis athletes, six Park Hill School District teaching grants, and 151 "Excellence in Education Grants" and support the Park Hill High School Tennis teams with uniforms and equipment.